May's update brings you a lovely religious work by the Buchschmid and Gretaux Wood Inlay Company's studios. This is of the Christ Head which was much of a favourite with Herr. Otto Chlup the owner of ABC Studios in Heidelberg who was the principal representative for the Buchschmid and Gretaux Wood Inlay Company. 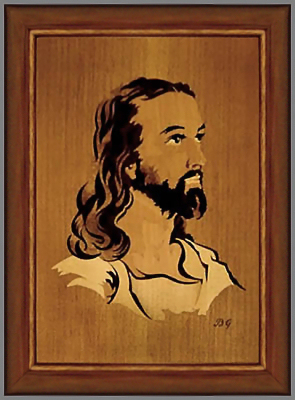 Our May update features the very collectable Christ Head (Christus Kopf) wood inlay picture by Buchschmid and Gretaux. This was one of their much favoured pieces and along with the Praying Hands piece it forms a much sought after pair of religious pieces from the B & G studios. There was an accompanying document that went with this picture, and we have reprinted it for you on this page. It describes the work of Buchschmid and Gretaux in their own words. 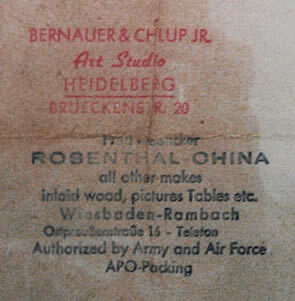 The Bernauer & Chlup JR. official stamp verifies the authenticity of the piece and the documentation. As the saying goes these days - enjoy! Thanks go to Beverly Mead for sending this in to us. “BG” inlay work is done with wood veneers in natural colors which are glued onto masonite. No warping. All the single pieces are cut out by hand on a powered jig saw. The finishing polish is alcohol and water resistant. An artist’s drawing, which is to be featured in inlay work, will first be transposed into a drawing in lines only, on transparent paper, of which then a couple of blueprints will be taken. These blueprints are ripped apart and the area for which a certain veneer has been chosen, for color and grain of the wood, will be pasted onto a choice piece of that veneer, or rather a small stack of several pieces. On a powered jig saw a highly skilled workman cuts along the contouring line of the area chosen for this veneer, with a precision approaching 1/300 of an inch. According to size and intricateness of the design there are anywhere between 50 and 1600 pieces to be cut out for one inlay item. The next move is assembling the intended design out of the pieces of veneer, by glueing them in place on a big piece of paper, mirrorwise. The sheet of paper and adhering pieces of veneer is then turned upside down and the veneer side glued onto a piece of wayrock, or masonite, a composite of wood shavings and glue which is imperviable to temperature and moisture, does not contract, crack or warp, - and now the topside paper is sanded away cautiously. After repeated sanding and applying several coats of a synthetic varnish with a silicone ingredient which makes the finished product alcohol – and water resistant, it is ready. First traces are found in China, adopted by Egyptian artists, mostly for symmetrical or geometrical patterns. The Moslem Invasion brought the skill to Spain, from where it is traced to Venice. Towards 1450 it came into its best historical time, after artists like Brunelleschi adopted perspective designs, landscapes or architectural scenes. Some churches and castles in Italy still show astonishing items and applications of inlay work. Around 1500 inlay work came to Germany, flourishing in cities which did most trade with Italy, like Nuernberg and Augsburg. Art deteriorated and was partially lost in the aftermath of the 30 years war, falling back to the original decorative and geometrical simple designs. Re-enlivened with the re-detection of the values of handicraft in reaction to the predominance of mass production. The degree of manual skill in making inlay work will forever limit available quantities. inlaid wood, pictures Tables etc. Click the above button to return to page 45 of "Can You Help"